Citation Information: J Clin Invest. 2018;128(1):531-544. https://doi.org/10.1172/JCI93707. Breast cancer cells with stem cell properties are key contributors to metastatic disease, and there remains a need to better understand and target these cells in human cancers. Here, we identified rare stem-like cells in patients’ tumors characterized by low levels of the proapoptotic molecule p53-upregulated modulator of apoptosis (PUMA) and showed that these cells play a critical role in tumor progression that is independent of clinical subtype. A signaling axis consisting of the integrin αvβ3, Src kinase, and the transcription factor Slug suppresses PUMA in these cells, promoting tumor stemness. We showed that genetic or pharmacological disruption of αvβ3/Src signaling drives PUMA expression, specifically depleting these stem-like tumor cells; increases their sensitivity to apoptosis; and reduces pulmonary metastasis, with no effect on primary tumor growth. Taken together, these findings point to PUMA as a key vulnerability of stem-like cells and suggest that pharmacological upregulation of PUMA via Src inhibition may represent a strategy to selectively target these cells in a wide spectrum of aggressive breast cancers. 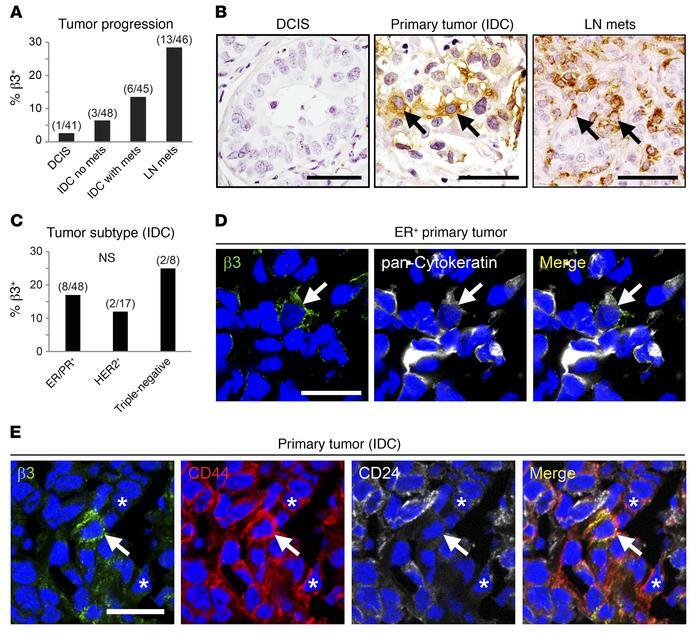 In breast cancer patients’ samples, αvβ3 identifies stem-like cells associated with tumor progression, independent of clinical subtype. (A–C) Immunohistochemical staining for β3 in breast cancer tissue microarrays representing various stages of disease progression (A and B)and clinical breast cancer subtypes (C). (A) Histogram displaying the percentage of tumors containing β3+ cells at different stages of progression of breast cancer including DCIS, IDC, with or without metastases (mets), and lymph node metastases (LN mets). P = 0.0001, by χ2 test for trend. (B) Representative examples of β3-expressing tumor cells (arrows) are shown for the breast cancer patients’ samples in A. (C) Quantitation of the frequency of β3+ tumors in different clinical breast cancer subtypes, including tumors expressing ER+/PR+ or HER2+ receptors or lacking all 3 (Triple-negative). (A and C) Numbers above each bar indicate the β3+ tumors per total number of tumors for each category. (D and E) Representative examples of immunofluorescence staining for β3 and pan-cytokeratin (D) or CD44 and CD24 (E) in frozen human breast cancer tissue microarrays. Arrows indicate β3+ cells coexpressing cytokeratins (D) or the stem profile CD44+CD24lo (E). Nuclei are stained blue in all panels. Asterisks in E mark CD44+CD24lo cells that lack β3. n = 6/17 (β3+CD44+CD24lo tumors/total). Scale bars: 50 μm (B); 20 μm (D and E). See also Supplemental Figure 1.